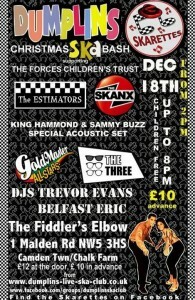 Mates SKArettes are joint hosting this with Dumplins Sunday 18th Dec All Dayer at The Mean Fiddler, London (Chalk Farm/Camden) with some Skabour bands and DJs including Folkestone’s OLAS and Coventry’s Trevor Evans. Supporting The Forces Children’s Trust. You still got time to get some tickets but please hurry as they are flying away fast! You are currently browsing the classic 2-tone graphics news archives for December, 2011.